OK, so there are only 7 Wonders of the World (currently they are Petra, Chichen Itza, The Great Wall, Christ the Redeemer, Machu Picchu, The Coloseum, and the Taj Mahal.) Seeing three of them now (Chichen Itza, Great Wall, and the Taj) I really feel the true wonders of the world are the people you meet along the way, or in this case while you are there. Many people would come up to me and ask to take their picture with me in front of the Taj. There was a family, a group of teachers, and others. Talking with them was a lot of fun. The basic facts of the Taj are well known, so I will share the new one I found interesting. The Taj is built at the bend of a river so the the water does not come too close, but close enough to moisten the wooden beams built into the foundation of the structure that act as rubber like shock absorbers to add cushion in the event of an earthquake. Also, the descendants of the original builders brought from Persia still live in the area and are the only ones who know the secrets of the glue used to keep the panels in place, making them the only ones able to make repairs. Oh yeah, it was also a monument to love or something. Getting a chance to drive through rural India was also a treat. Considering that over 70% of India is rural (hard to imagine) it is good to get a glimpse of that part of India, even if it was only through the window of a bus. Thinking about the relatively small section of students in India that have access to the type of education available in the Private schools, helps add to the complexity of the picture of India. Only a few percent in India is still about the size of the US, so things can get complicated. Getting to some words of wisdom as I wind up my travel blog, I guess the main thing I've learned is that buildings and statues are just things, the real treasures are found in the smiles that cross all cultures, the people you meet, and the relationships built along the way. After spending 2 weeks in India it is impossible to understand much at all, what is possible is to start and develop the questions to ask. The overwhelming sights, sounds, smells, and feelings all add to a real excitement. Everything in India seems to have an opposite right next to it, only adding to the complexity. A lasting image of India for me is a beautifully colored saree blowing in the wind. 1. 4 people discuss your purchase and fill out a reciept. 2. The goods were lowered by a bucket on a rope down to the first floor. 3. We had to proceed to the pay window with the filled out receipt. 4. After paying we then had to go over to the pick-up window and receive our items. Most other stores at leas followed the process of pick the item, get a receipt, go to a separate area and pay, return with the receipt and get the item. It seems very inefficient, but I guess when the goal is to employ as many people as possible, convenience for the customer is less important. I continued to be blown away by the students and how nice and hard working they were. The interactions were a real highlight of the experience and I look forward to them continuing as we plan some projects between our students. 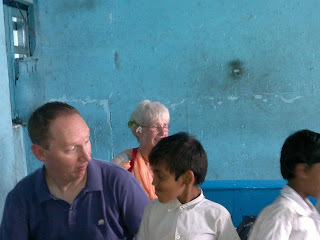 Here I am sporting my Kurta that was a surprise gift from the principal. A perfect fit and it even matched. Today we visited a great school called the Loreto Day School Sealdah (http://www.loretosealdah.com) The main thing was the Rainbow Program that takes orphans, street kids, rural migrants, etc... and gives them a place to stay at the school while paring them with their more well off students who work with them part of the school day. They also train teachers in more student centered teaching approaches. I was really impressed and saw they are making quite a difference in the lives of kids from all different levels of society. After a sweat drenched cab ride back to "our school" I did a brief workshop with some teachers on implementing 21st Century Skills into the curriculum. The day ended with a cultural singing and dance presentation by students and staff. Evidently not only is everyone in India an Engineer or Scientist, but they can all sing and dance amazingly. Another great part was the informal interactions with students afterwards that was outside of a classroom and just some time to talk with some great kids. As if that was not enough, we followed that up with a visit to the Queen Victoria memorial and museum about live in India during the British rule. If you have heard car horns in India it is no surprise that when the museum is closing they blow whistles at you until you leave. Morning Assembly is quite an interesting way to start the day. All the students gather to hear remarks from the Principal on upcoming activities and to celebrate accomplishments. All this takes place in front of the Goddess of Learning: Saraswati and concludes with a prayer and the class groups marching out. Here is a birds eye view of the proceedings. Today's Indian History fact I did not know, was about Sabhas Chandra Bose who had different ideas from Gandhi on how to get independence. He supported violence and formed an army to fight the British, he went to help from Russia, then Germany, and Japan. After Germany and Japan were defeated in WWII his troops lacked supplies and many leaders surrendered, Bose did not and supposedly fled on Japan plane and died in mysterious circumstances. We also visited a school for street children in Kolkata. Most of the kids were not there because the school had not been getting it's mid-day meals, leading many of the children to go out begging. The students there still rose and said "good morning sir" and were doing their best to learn as I tried to distract them by making faces. We finished up with a student panel on the impacts of Western Globalization on culture, the environment, women. They discussed the good and the bad impacts, but agreed the current impact from the US has increased over that of Britain. The students discussed the need of choosing what to take and what to keep.They did feel that India's philosophy and sense of family combined with unity out of diversity are some of the major things India could contribute to the West. However it seems, boy bands are universal. Well, today I learned a little about Cricket during a visit to the Calcutta Cricket Coaching Center. It was very difficult not to revert to Baseball style when batting. Sitting for a spot of tea afterwards helped to add to the feeling of being in England (except for the humidity). I ended on a good hit so I could leave feeling like I was picking it up. I did not try bowling though, although I did practice the grip and discuss some tactics and polishing the ball. The Center is a great green spot in the middle of the city for the kids to practice the game. With some amazing teachers and coaches providing such opportunities. I also came across one of the many "pick-up" Cricket matches played anywhere there is space. The equipment may be different, but the passion is the same. Another person for me to make sure I teach about when I get home is Rabrindranath Tagore who was a very influential writer, painter, philosopher, freedom fighter, musical pioneer, that traveled around the world receiving honors and spreading influence. We visited his home and museum while hearing all about the impact he had on India. A special visit was also arranged to visit the Marble Palace to get a glimpse of how the Rajas of Indian lived/continue to live. The Rajas were Indian Princes allowed to retain power and wealth if they helped implement British rule (the British only had about 5,000 citizens here to rule India through the local officials). There were paintings and sculptures from around the world, it would have been amazing to see in it's day. Some descendants of the Raj still live in part of the mansion. We finished off the day with an amazing lunch that has left me without needing to eat for the next few days. The delicacy was a "protected" dish that is only available at this one restaurant. Chelo Kabob consists of rice, egg, chicken kabob and mutton (goat), finished off with a Mango desert. We arrived into Kolkata to get some experience of India different from the mild weather of Bangalore. Rainy and humid, now I feel like it's monsoon time. After checking in and getting some sleep we started our day at the school I will be at for the week. After navigating some intense traffic we arrived at the school. Walking through the gate of a school with 4,000 students can be a little overwhelming, not to mention going up on stage for morning assembly to be welcomed and make some remarks. After my introduction was fun to have all the students greet me with "good morning sir" as I walked the hallways. I gave a presentation to some students on life in Nebraska and then sat in on some classes observing and answering questions. Yes, it does seem that Justin Bieber is big everywhere. Being familiar with him because of my daughters did score me some points with the students. It was great interacting with the students and teachers, I am looking forward the next few days working with all of them. Coming up this weekend I may get a little cricket in, so you will want to stay tuned for that.